The Emitter is the place where particles are born and given their initial velocity and direction. These parameters control characteristics such as the emitter's shape, style, and position. The Behavior dropdown menu contains three options: Continuous, Explode, and From Emitter Speed. Continuous is the standard default behavior, it continuously emits particles. The Explode option automates the process of creating "explosion" style behaviors. In previous version you would have to do this with keyframes. Setting a keyframe for Particles/Sec with a high number at the beginning of your timeline and one immediately after that at 0. From Emitter Speed adjusts the Particles/Sec depending on the speed at which your emitter's position changes: if the emitter isn't moving its speed is zero, so no particles are emitted. 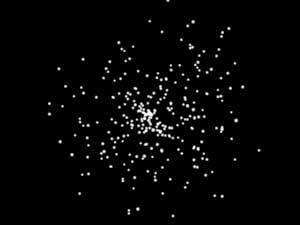 As the emitter's position is animated, particles are emitted proportionally to the speed, with the Particles/Sec value working as a percentage. Note that in the Designer the Emitter speed is not accessible, so particles are only visible when dragging the emitter in the preview window. Controls how many particles are born each second. 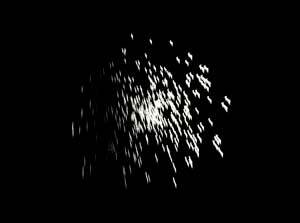 Low values means sparse particles and are normally fast to render. 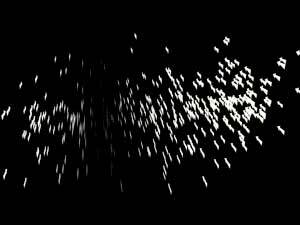 High values make lots of particles and can be slow to render. This value can be keyframed so the particle emission varies over time. Its value can also be modified by the Particles/sec Modifier when the Light(s) Emitter Type is active. 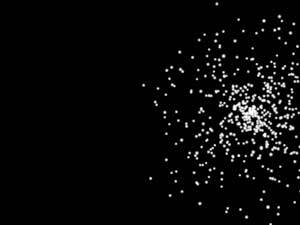 Left to right, Particles/sec at 100 and 600. When enabled, the Particles/sec parameter for this system becomes a percentage of the Master Systems' Particles/sec value. Disabling this (the default) makes the the system's Particles/Sec parameter behave independently. Emitter Type: Sets the shape and functionality of the Emitter. There are eight types. See the Emitter Types page. 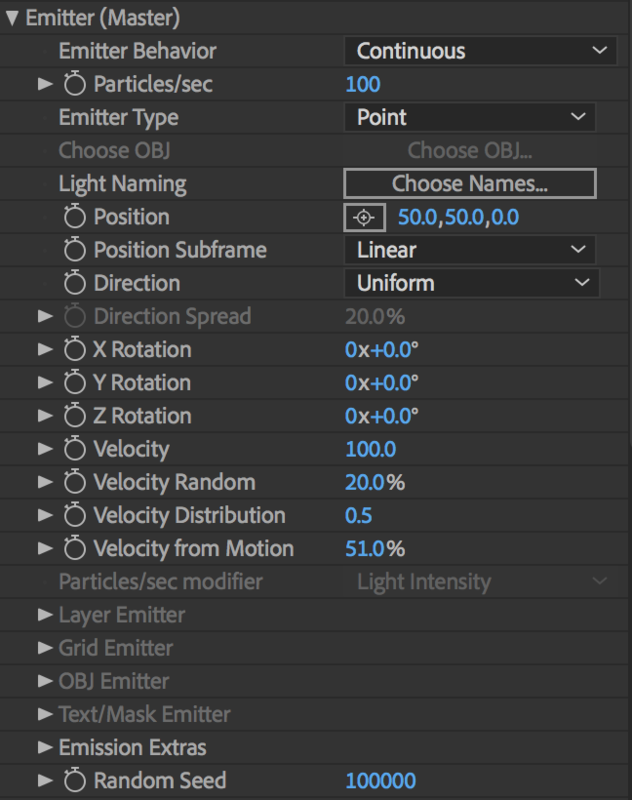 Choose OBJ...: Brings up a dialogue of OBJ presets to use when an OBJ is selected from the Emitter Type menu above. You can also import your own OBJ using the Add New Obj. option in the top right of the box. Light Naming (Master System only): When Light emitters are selected as an Emitter type, you'll need to use lights from within your composition as Emitters and/or Shadowlets. Light Naming brings up a dialogue for you enter the name(s) of your Light layers from within the comp. 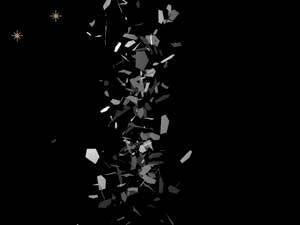 The position in 3D world-space where particles are born. These values can be keyframed over time to create trails and similar effects. Set Position X to move left or right around the X-axis. Set Position Y to move upwards or downwards around the Y-axis. Set Position Z to move closer or further to the camera around the Z-axis. Left to right, Position XY is moved to the upper left, center of comp, and lower right. Left to right, Position Z at 300, 0 and -600. This toggle allows you to set the system's position relative to the master system. By default it will behave independently, centered in the middle of your composition. But if you want your secondary systems to move along with your master system, you'll want to enable this option. Enabling this will alter your Position Coordinates from the parameters above to treat the master system as its reference point, rather than the center of your layer. Position Subframe smooths out the movement of the particles. The interpolation is linear, which means each frame is interpreted linearly. If you have a slow moving Emitter, than this works because the particles are moving so fast that everything looks smooth. But if you want the emitter to move fast, this is a problem because you will see jaggies. There are four options. By default, Position Subframe is set to Linear. 10x Linear typically takes care of the jaggies issue. Useful when the Emitter has to move really fast. Set to 10x Smooth if you need the movement even smoother. Exact (slow) will make the movement very, very smooth. This popup controls the direction in which particles move initially. There are five settings. The default is set to be a random movement. Uniform Initial direction is completely random. This is the default setting. Bi-Directional Emits in two opposed directions at the same time. Use Direction Spread andX, Y, Z Rotation to control the beams. 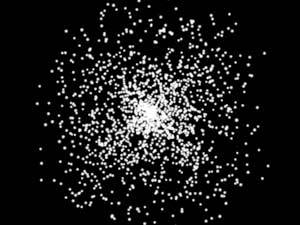 Disc Emits in a plane so particles form a disc over time. Outwards Emits outwards from the center of the Emitter. For a Point Emitter, this is the same as Uniform, therefore the Grid Emitter is shown here. Inwards Emits inwards toward the center of the Emitter. For a Point Emitter, this is the same as Uniform, therefore the Grid Emitter is shown here. Controls the spread of the particle beam for certain Direction Types. Used with these Direction Types: Directional, Bi-directional, Disc and Outwards. Disabled for Light Emitters, read more about Light Emitters. Left to right, Direction Spread set low and high. Direction is Directional. Left to right, Direction Spread set low and high. Direction is Disc. Rotates the Emitter around the X, Y and Z axes. Set X Rotation to rotate forward or backwards around the X-axis. Set Y Rotation to rotate to the left or right around the Y-axis. Set Z Rotation to rotate around the Z-axis. Velocity sets the initial velocity of newborn particles. 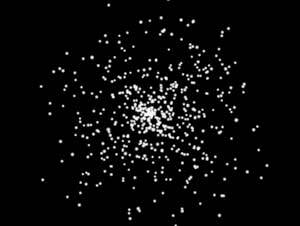 Higher values make the particles move fast. 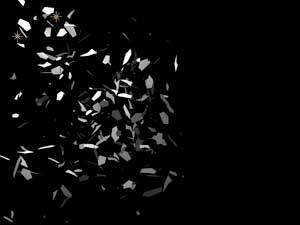 Lower values make the particles move slow. When set to 0, no particles are emitted. 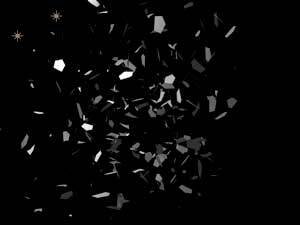 This parameter is sometimes referred to as 'Initial Velocity' in the Trapcode Particular documentation. Determines the distribution of random particles toward the higher or lower end of the allowed velocity above and below the initial velocity. Lower values result in particles below the initial velocity, while a higher value will give more particles above the initial velocity. 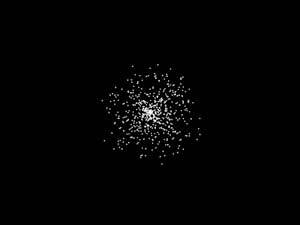 Lets the particles take on, or 'inherit', the Velocity from the Emitter. For this parameter to have any effect, the Emitter must be in motion. Negative values gives a feel of a 'jet' spray or engine. 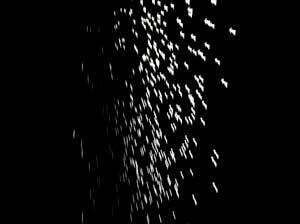 The particles spray opposite to how the Emitter moves, and they appear to push the Emitter forward. Positive values gives the effect of something that is letting off particles as it moves, like stars from a magic wand. Positive values also gives a look of particles getting caught in the draught of the moving Emitter. A value of 0 means the Emitter motion has no effect on the particles' initial Velocity. Sets the size of the emrission area of some Emitter Types. This control is enabled for Box, Sphere, Grid and Light emitters. For Point emitters, this control is disabled. For Layer and Layer Grid emitters, only the Z parameter is enabled since their X and Y size is controlled by the size of the layer. Here is how Size works. Set Size X for the emission area to become wider or narrower. Higher values make the emission size larger. Set Size Y for the emission area to become taller or shorter. Higher values make the emission size larger. Set Size Z for the emission area to become deeper or more shallow. Higher values make the emission size larger. 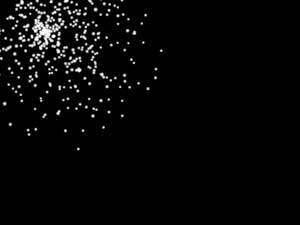 This parameter lets you emit particles from lights. Only active when the Light(s) emitter is the Emitter Type. See Light Emitter page for details. This parameter group lets you emit particles from layers. Only active when the Layer emitter is the Emitter Type. 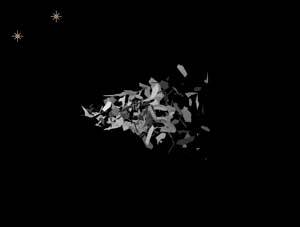 See Layer Emitter group page for details. This parameter group lets you emit particles on a 2D or 3D grid. Only active when the Grid or Layer Grid emitter is the Emitter Type. See Grid Emitter group page for details. This parameter group lets you emit particles from an OBJ. Only active when an OBJ is selected as the Emitter Type. See OBJ Emitter Group for details. This control is used to pre-run the system so that particles can be visible at the first frame. The pre-run value is a percentage value where 0% is no pre-run. At a value of 0, the simulation essentially starts at the first frame where no particles have been emitted. A value of 100 translates to a 100% completion of the emission of particles on the first frame. 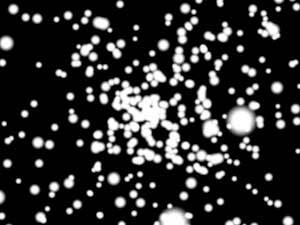 At 100%, all particles that should be emitted at the first frame will appear based on Emitter controls like Velocity and the particle life. This control is used to emit particles at random intervals. It is only useful when using a directional emitter with Direction Spread at 0. When using two or more Lights as Emitters, this control lets you use a unique random seed for each of your lights to create variation in your scene. Unique Light Seeds also affects Streaklet random seed, so different lights get different Streaklet appearance. NOTE: The Random Seed needs to be set to 65536 or higher for this to work. The Random Seed controls all random parameters in the effect, like Velocity Random. It is useful when duplicating the effect and a slight variation of particle positions (etc) is needed. It is also helpful when the animation just doesn't look good since this value can be changed for varying looks.